Vinnie is a forty-something taxi driver and for all intents and purposes he's a single dad to his two children as their mother, his wife, walked out on them several years earlier because of psychological problems. His teenage daughter is starting to rebel and his young son is still wetting his bed, even though he should've grown out of this by now. So Vinnie has his hands full at home and he doesn't tend to socialise with many people other than his mum, who pretends she's still 65 even though Vinnie knows she must be much older; his best friend Kenny; and Janine, who works for the same taxi company and is always flirting with Vinnie, though he doesn't act upon her suggestions. All of this changes when he meets Ellen. He's been driving her from her home to a physiotherapy clinic every Friday without taking much notice of her, but when he has a panic attack in the car and she drives him to the hospital their relationship slowly but gradually changes. The moment they connect outside of the driver/customer relationship was a landmark for the both of them; Vinnie because he comes to the realisation that he's not invincible and he has to take better care of himself so in turn he can continue taking care of his children and Ellen because she hasn't driven a car ever since she got in the accident that gave her a nasty scar across her face and the limp for which she goes to her weekly physiotherapy sessions. So far it sounds like a fairly straightforward romantic novel about two adults struggling to find love, but the story is more complicated and unpredictable than that. Ellen lost far more than she initially leads on and when Vinnie's wife makes a reappearance it seems as if his tentative romance with Ellen is over before it has even truly began. Despite Vinnie and Ellen's compelling backstories I found it difficult to relate to them from the start and I was far more invested in the smaller characters, particularly Vinnie's daughter Kerry, the colourful best friend Kenny and Vinnie's unbeatable and ageless mum. However, as the story progressed I started to feel a connection to the leads as well and I really routed for these two broken people to find the love they deserved, especially after everything they'd been through already in life. 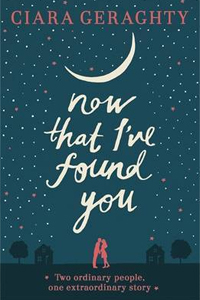 Now That I've Found You may not be an ordinary man-meets-woman romantic novel, but its unexpectedness took me by surprise and made it a rewarding read in the end.